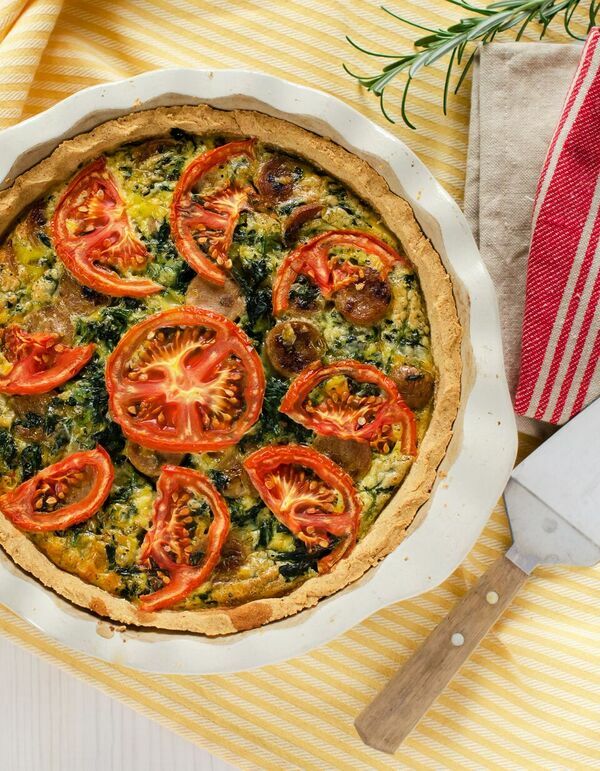 This is a beautiful quiche with a wonderfully rich crust. Perfect for taking to a Mother’s Day get-together. Non-THMs won’t have any idea that this recipe comes from a “diet”cookbook. You can skip the crust if you want to make things easier on yourself or use a quick Simple Simon Pie Crust (page 324 of the THM Cookbook), omitting the sweetener, as it requires no pre-baking. Another option for a simple crust is to combine 1 cup almond flour with 1 egg white and bake for 10 minutes to crisp it before filling. Make the crust. Place the Baking Blend and butter in a food processor and process until well combined, like coarse meal. Add the egg yolks and pulse to mix well. Add the tablespoon cold water and pulse again. You should be able to press the mixture together and have it stick; if it doesn’t, add a little more cold water. Gather the mixture into a ball and flatten the ball. Put the flattened ball between 2 sheets of parchment and roll out to a large circle if you are using a pie plate or a large rectangle if using a 9 x 13-inch baking pan. Remove the top parchment and use the rolling pin to invert the crust into the baking dish. If the crust breaks apart, gently press it back together and press into the pan. Bake the crust for 10 minutes. Let cool briefly to set. Keep the oven at 350 degrees F.
Make the filling. In a bowl, whisk together the eggs, egg whites, sausage slices, spinach, grated cheese, seasonings, and optional ingredients like mushrooms, tomato, and olives. Pour into the crust and bake for about 45 minutes, or until the filling is set. This is a NSI (No Special Ingredients) recipe if going crustless or making an almond flour crust.